EDMONTON — NDP Leader Thomas Mulcair is gearing up to take a tougher stand against Justin Trudeau, after party officials concluded that Tory attacks ads have not worked to blunt the Liberal leader’s momentum. In a speech to his caucus Thursday, Mulcair is expected to compare and contrast the Liberal leader’s inexperience with his own decades in public life. Mulcair is expected, for example, to say that, unlike Trudeau, he doesn’t require on the job training. Although the ads helped frame Trudeau as inexperienced, they reaffirmed the Conservative party’s meanness, and the NDP is quite content to let the Tories bear the negative backlash from such attacks, a source said. “Trudeau is a likeable guy,” one advisor told HuffPost, but even some Liberals acknowledge that he is not ready to be prime minister. Mulcair is expected to hit on those themes in a bid to get Canadians to question themselves about Trudeau’s experience and aptitude and the Liberals’ priorities. NDP MPs at the party’s caucus meeting in Edmonton this week suggested that Trudeau is not ready to participate in the G7 or sit around G20 table with other world leaders. MP Robert Aubin questioned whether Canadians really want Trudeau to answer the phone when the president of the United States calls. Brian Mason, the leader of the NDP in Alberta, said he expects the federal party is going to ramp up its criticisms of the popular Grit leader. While some MPs cheered, at least one MP seemed uncomfortable with the thought of attacking the Liberal leader. “Whacking the other guy on the side of the head doesn’t necessarily get you anything other than you beat somebody else up. So what? So what are you going to give Canadians?,” MP Malcolm Allen told HuffPost. Mulcair later suggested that he wasn’t going to criticize Trudeau and the Liberals but rather will speak in the year ahead more about what a New Democrat government would look like. “We are talking about ourselves,” he insisted. 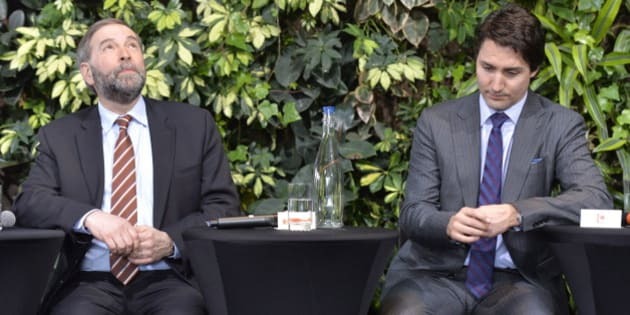 Although Allen insisted that he “quite frankly” doesn’t care about Trudeau, he wasted no time in playing down the Liberal leader’s chances of sweeping the country in a fashion similar to late NDP leader Jack Layton with his 2011 electoral success in Quebec. People seem to think that came out of nowhere, Allen said, but they forget that Layton was a seasoned politicians with 35 years of experience, who had led the party since 2003 and had spent eight years building his team. Mulcair told caucus members Wednesday that the NDP will go into the election ready to govern. Mulcair told reporters there is a lot of work left to communicate this message to Canadians, but he hopes that releasing concrete policy proposals months before the election will allow that contrast to shine through. “Neither Mr. Harper nor Mr. Trudeau is putting anything substantive on the table; we are,” he said. "People are tired of talking points, they're fed up with partisan attacks, they don't want empty phrases and platitudes, they want things that are real. So we are going to be rolling them out one by one," he said. If Canadians want change, she said, they can trust the NDP to deliver that change. NDP advisers said they did not set out to talk more about Trudeau but will talk more substantively about themselves as a response to public opinion surveys that have him leading in the polls and to reporters’ fascination with the other two parties. “And naturally that points out [Trudeau’s] weaknesses, and so it’s a good fit,” Blaikie said. The Conservatives “can’t do this kind of substantive contrast because — except for part of their base — people don’t like their ideas either,” she said. With 97 seats in the House of Commons, compared with the Liberals’ 37, Blaikie said she believes it is pretty unrealistic that the Grits will form the next government.